First, I want to say thank you to everyone that linked up to my first Saturday's Critters. I think it went very well. And I appreciate all my blogging friends that left comments and wished me well on my first attempt at a MEME. So, here goes Saturday's Critter #2, I hope you can join in on the Critter party. A new way to clear a path on the deck...The Shoveling Squirrel. These are some of my critters from last weekend. Last Sunday, received our first big snowstorm.. Leaving us with about 8 inches of the cold, wet white stuff..
Our first real snow..we had about 8 inches..last weekend..and then to top it off we received freezing rain on top of the snow. A cute Dark-eyed Junco..one of my winter birds. In the mosaic are some male and female Cardinals..a few Mourning Doves, the Dark-eyed Junco, and in the bottom middle there is a White-Throated Sparrow in between a male and female Cardinal. 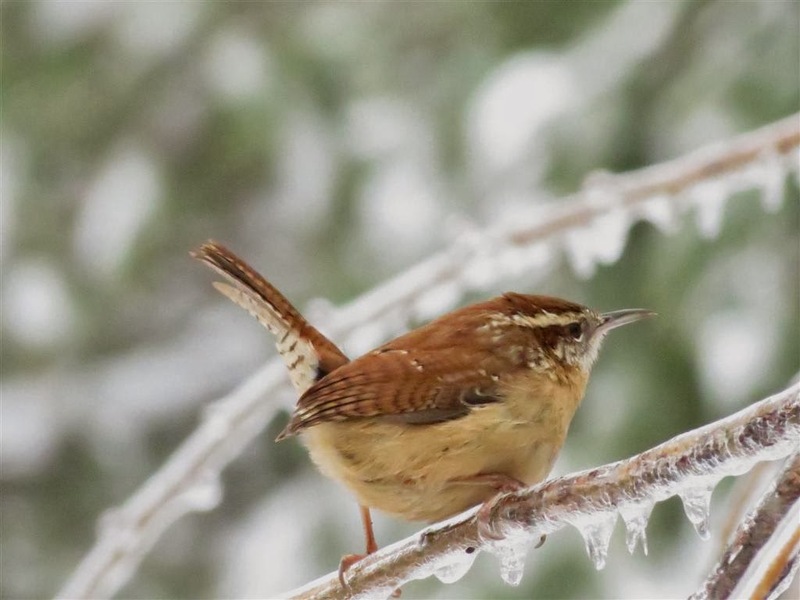 A cute Carolina Wren on an icy branch. My male Cardinal looks like a tree ornament on the feeder. The Cardinals look beautiful in the snow..I tried several times to clear a path to get to my feeders...it was snowing so hard and laying faster than I could clear it away..the birds had to use their feet to get to the seed under the snow on the deck railing. Another Snow/Sleet/Rain event for today and winter has not officially really started yet, do you think we are in for a bad winter? I am so happy you joined in on my Critter party....I hope to see you linking up again..
Hi,Eileen. Nice captures. The red cardinal photos are very beautiful. Wishing you a wonderful week ahead. I think hubby could use a couple of those "shoveling" squirrels to help him! LOL! Love the little wren-they are always so sweet looking. Have a good weekend, Eileen! I love all your beautiful critters. You have so many cute wintering birds enjoying your feeders in spite of the deep snow. They are lucky to have a bird-luver in their neighborhood. Hopefully this is your last hard snow. I'm a big fan of dark-eyed juncos. I haven't been able to capture any with my camera this year because they are still quite skittish when they see me. I really like your cute little wren. Wow ! the red bird is amazing !!!! have a good weekend ! Your yard looks like ours Eileen, and the shovelling squirrel is just too cute. I can't tell you how many times I've tried to capture the male cardinal on the evergreens out back, surrounded by snow. By the time I pick my camera up and focus - gone! I love the contrast of the red cardinal against the white snow - so beautiful. And that squirrel looks like he's having a blast! The cardinal adds the perfect splash of colour to the snowy scenes. They are our favourite birds at the feeders. We don't see wrens at this time of the year thought. Enjoy the day. Hello Eileen!!!Wow! !You had a lot of snow in your area! !How cute the Squirrel looks! !How beautiful looks the red cardinal against the white snow!! !What a lovely bird!!! !Thank you for sharing those wonderful pictures! !Have a happy new week! !Good luck to your MEME!!Hugs! What a nice picture of the squirrel and birds in the snow, Eileen!!! 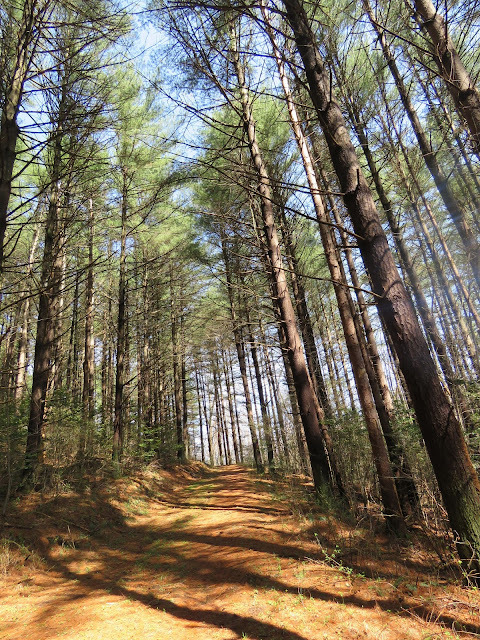 Wonderful photos Eileen! The cardinal at top of the feeder takes a prize! Your snowy photos are so beautiful, especially of that male cardinal. The shoveling Squirrel is hilarious. Great shots Eileen :) I love the snow photos particularly. The male Cardinal certainly looks like a tree ornament with his bright red color :) The shoveling squirrel is so cute! Glad you are enjoying the joys of winter Eileen :) Hugs! Very festive colours in your post today Eileen and I really like the Christmas Cardinal. Have a lovely, busy weekend with your meme and thanks for hosting again. the squirrel is hilarious - leaving a trail of spent seeds in his wake. :) your winter birds are so pretty in the snow, even if it makes eating more difficult for them. :) good luck w/ today's storm! Wonderful shots, Eileen. It's amazing how these little animals can survive and even thrive in such harsh weather. Nature has equipped them well. We didn't get much in the way of snow, but we got the ice. Love the squirrel photos! He looks like a little bulldozer! LOL! AWESOME images for today....the snow makes everything better!! the squirell is just too cute for words, good thing for that heavy fur coat!! and your welcome eileen, i am so very happy to be here!! We are having our first snowstorm this morning - but I think all the birds have disappeared into the trees! Beautiful photos of the birds in winter atmosphere. The collage is really great, very nicely done, Eileen. The cardinals do look very beautiful in the snow... until we started traveling, the only way I ever saw these birds was in the snow on a Christmas card! (No cardinals in the Pacific Northwest.) I still haven't seen them in the snow except in pictures -- and yours are certainly more lovely than any Christmas card I ever saw!!! Beautiful pictures of the winter scenery. Oh what a great variety of critters in the snow Eileen. I love squirrels, and your first shot made me laugh out loud! That red cardinal is a beauty. Fun photos! Hi Eileen, What an iconic photo - a male Northern Cardinal in the snow. Beautiful! I am wild about that Dark-eyed Junco, too1 Have an excellent and hopefully warmer Sunday tomorrow! Great photos! The cardinal is such a beautiful bird! We're getting a snow storm here today in CT, and we had snow earlier in the week, too. Ugh. Your photos are fabulous of critters in the snow. Both of those cardinal photos should be framed and hung someplace special. I love your header too. I've never seen a squirrel burrow through the snow like that. So cute! You caught some fantastic shots of your wildlife in the snow! I love the red cardinal especially. Congrats on your successful new meme... I'm sure it will do well. 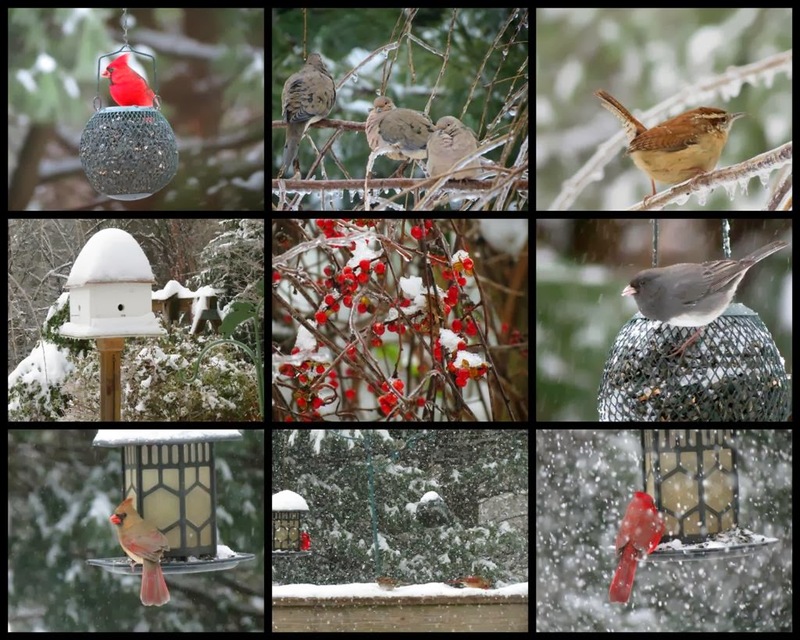 Love seeing your birdies --and especially love seeing the male Cardinals in the snow... So gorgeous! The shoveling squirrel is working hard, wonder what he thinks is under all that white stuff? That little Carolina Wren is adorable. Cute and also very wonderful shots, Eileen. But I felt sorry for them. Can they survive? Yea what a fun linky - I love the photo of your red cardinal in the snow. Our dd loves squirrels I've emailed her your post she will enjoy it. That first image of the squirrel is a hoot. And the wren this time around is my favorite bird image. Congratulations Eileen. I must have missed this the first round. I am so proud of you! I am not brave enough to venture where it is unknown ;) I have a brand new computer...giving me fits and just learning it is a huge task, yet I shall move one day at a time. The Squirrel images are too cute! Brave little birds. The Carolina Wren is my fave. 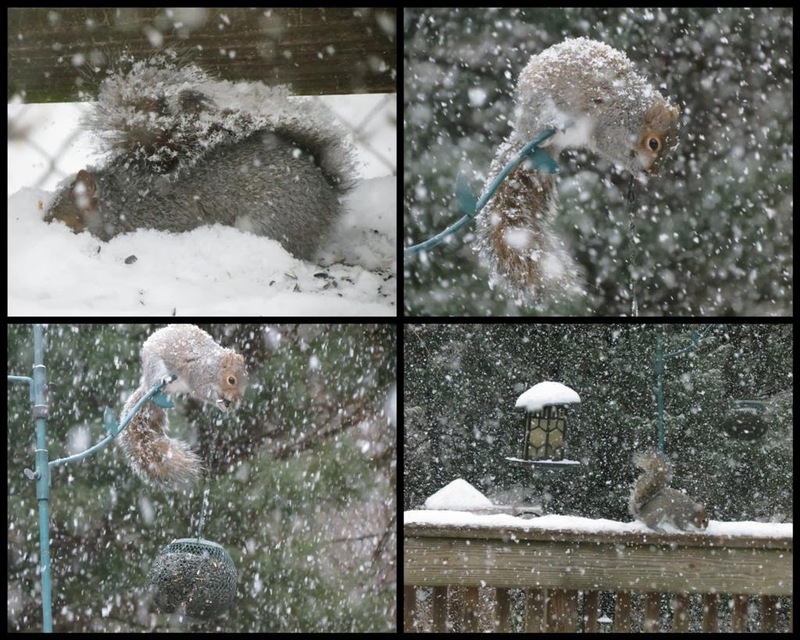 I enjoyed all of your critters this week, especially the snow shoveling squirrel. You got wonderful pictures of the cardinals. love all your critters. Especially the very red "ornament" you shared. glad you link is doing so well. enjoy!! The Cardinal is stunning, the color just pops on my screen. You must have known I'd drop in ... all that Faaaabulous RED!!! What a fantastic shots you show here. Great with all ice and snow. That red cardinal is really amazing. It certainly has raised lots of interest. It looks as if you're having lots of snow already - good for Christmas! Freezing rain on top of the snow!? Oh no! Superb shot of the cardinal! Fun pictures of your squirrels!! How lucky they have such a bushy tail to protect them from the snow!! I don't understand how birds make it through the winter cold!! Love your critter party!! That's quite a nice snowfall you had, giving an opportunity of interesting pictures! I love your squirrel... Ours are red! Cheers and keep warm... we are having +17°C these days with -3 early in the morning!! So you can see the picture? Funny, I can't it has been showing "processing image" for 1/2 an hour! OK, I see it now!! such a wonderful selection of birds, and that looks a very diligent squirrel! Wonderful photos! The wren is so cute. I was away for the weekend and won't join in this week. Have a great week, Eileen! Love the squirrel burrowing through the snow. Very cute! These are beautiful shots and you've got so many different birds too! Beautifully who kardianlen in the snow Eileen. I find that so beautiful to see! I just do not know quite what you mean by linking or linking your blog! ?